Art Pope was elected to and served four terms in the North Carolina House of Representatives, House District 61, located in Wake County, from 1989 to 1992 and 1999 to 2002. He was elected Republican Joint Caucus Leader for the 1991-1992 session. During his time as a state legislator he served on the Appropriations, Finance, Ways and Means, Judiciary, Education and Revenue Laws Study Committees. After being ranked as one of the most effective House members in the 1991 session, Pope ran for Lt. Governor of North Carolina in 1992. Pope won a three-way Republican primary in May of 1992, but lost in the general election to Democrat Dennis Wicker. Pope is an activist in the Republican Party, having served at every level from precinct chairman to chairman of the NC Republican Party State Convention, to delegate to the Republican National Convention (1992, 1996, and 2008). 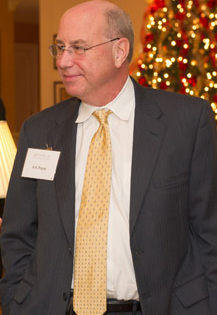 Art Pope has an established, documented record of reform in his Legislative career, as well as a reformer of North Carolina’s state government, public education, budget, and taxes. As a legislator, Art Pope was leader in the fight to reform state government — to make it more open, transparent, and accountable to the people. The first bill Art Pope introduced as a freshman legislator in 1989 was to end the North Carolina General Assembly’s exemption from the state’s open meetings law. While the bill did not pass during his first session as a legislator, Pope did sponsor legislation to end the legislature’s exemption from the open meetings law (and make other needed reforms) that was enacted with bipartisan support in the next legislative session. Pope also successfully co-sponsored legislation for lobbying reform, including putting an end to lobbyists’ contributing to legislators while the legislature was in session. As a former legislator, Pope was a founding member of the broad NC Coalition for Lobbying & Government Reform. Pope joined former Democratic state Senator Wib Gulley in kicking off a successful lobbying reform campaign that called for the ending of “goodwill” gifts from lobbyist to legislators, limiting former legislators from going through a “revolving door” and immediately lobbying their former colleagues, and other reforms. Art Pope served on the Education Committee during all four terms he served in the NC House of Representatives. In response to a 2011 attack by the state teachers’ union — the North Carolina Association of Educators — Pope pointed to his “long public record as a Legislator of supporting and voting for education reform proposals to increase funding for low wealth and small school systems, and for local flexibility and accountability, that were eventually adopted with the bipartisan enactment of the ABC’s of Public Education, the Excellent Schools Act, and the first Charter School Act in the 1990′s.” Pope went on to note that the teachers’ union was attacking him for his continued support of specific education reforms, including merit pay for teachers, standardized testing to measure student performance, providing general liability insurance for teachers, and his opposition to the state government deducting union dues from teachers paychecks. To stop North Carolina’s boom and bust state budget cycle — years of increased state spending followed by budget shortfalls — Pope sponsored legislation in 1990 and 1991 to limit the state’s fiscal year spending to its prior calendar year of actual revenue collections, and place part of any end of the year surplus into a state savings reserve account, known as the “Rainy Day Fund.” Pope’s proposal for a savings reserve account was enacted by the General Assembly in 1991. Pope continued to support a variation of budget reform by drafting and sponsoring legislation to limit increases in government spending to inflation and the state’s population growth, known as the Tax Payer Protection Act, and also referred to as the Taxpayer Bills of Rights or TABOR in other states. Art Pope has supported tax fairness, based on a uniform and simple tax code, since he first served in the General Assembly. Pope debated in favor of and voted for the Tax Fairness Act of 1989. The Tax Fairness Act of 1989 simplified North Carolina’s income tax by basing it on the Federal income tax and simplifying the state income tax brackets. It was revenue neutral, even while eliminating 700,000 low income NC families from paying state income taxes and lowering the income tax burden on the middle class (65% of NC), with a slight increase on higher income earners. As a Legislator, Art Pope served on the House Finance Committee for three terms, and was appointed by Speaker Jim Black to serve on the Revenue Laws Study Commission in 1999. While promoting tax fairness and simplicity, Art Pope consistently voted against legislation to increase the regressive statewide sales tax.